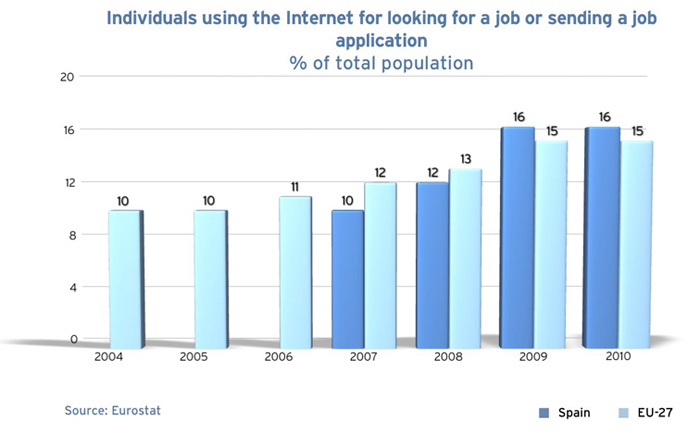 In the EU-27, the percentage of individuals who used the Internet for looking for a job or sending a job application was 15% in 2010. Denmark and Finland are the countries recording the highest values for this indicator. At the other extreme, there are countries like Romania and Cyprus with values far below the European average. Spain records a value of 16%, above the EU-27 average, and also a greater growth rate, since in 2008, the value for Spain was below the EU-27 average. Number of individuals, expressed as a percentage of the total population, who have used the Internet for looking for a job or sending a job application in the last three months.